Shagufta Kausar and Shafqat Emmanuel, a Pakistani married couple in their 40s, were sentenced to death for blasphemy in April 2014 after Shagufta allegedly sent blasphemous text messages to a local cleric and a lawyer. Shafqat is paralysed from the waist down, having fractured his spine in an accident in 2004. He and Shagufta lived with their children in a church compound in Gojra, Punjab Province, and she supported the family by working as a cleaner. They are being held in different prisons about 250 km apart: Shafqat is in Faisalabad District Jail, while Shagufta is in Multan Jail, where Asia Bibi is imprisoned. Shafqat has spent months in hospital because of extremely painful bedsores all over his body. The text messages were sent in June 2013 from a number allegedly registered in Shagufta’s name. The messages were written in English, but Shagufta and Shafqat have said they could not have written the texts because they are illiterate. They are unable to write proper Urdu, let alone English. They said they lost the phone in question before the texts were sent, and that the SIM card in it was not theirs. Local police registered a blasphemy case against the couple on the complaint of cleric Muhammad Hussain and lawyer Anwar Mansoor Goraya. Gojra City Police arrested Shagufta and Shafqat on 21 July 2013 and charged them with blasphemy under Sections 295-B (insulting the Koran, punishable by life imprisonment) and 295-C (insulting Mohammad, punishable by death). On 4 April 2014, a sessions court in Toba Tek Singh, Punjab Province, sentenced them to death. The Farrukh Saif Foundation lodged an appeal, but no date has been set. Lawyer Nadeem Hassan said that to appease mobs led by Islamist clerics, the police tortured Shafqat into confessing before a judicial magistrate that he had sent the messages. He said Shafqat retracted his statement when lawyers requested the session judge to record his statement again. Shagufta and Shafqat have four children, aged between ten and 15. Their paternal grandfather Emmanuel Masih is caring for them and the Farrukh Saif Foundation is providing education and a safe house. The family lived in Gojra until the time of the blasphemy allegation, but for security reasons the children had to be moved to Toba Tek Singh after huge protests over the incident. 18 June 2013 Blasphemous text messages were sent to a cleric and a lawyer from a phone allegedly registered in Shagufta Kausar’s name. 21 July 2013 Shagufta and her husband Shafqat Emmanuel were arrested and charged with blasphemy. 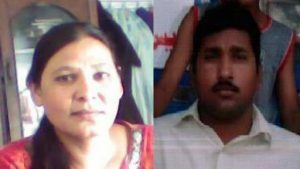 4 April 2014 A sessions court in Toba Tek Singh, Punjab Province, sentenced Shagufta and Shafqat to death.